Stop down metering by definition is completely manual... in other words you are the one to stop down the lens. so, tripod-only shooting then eh? Why would this mean tripod only? Image stabilisation doesn't work (without an electric adapter), granted, but none of the 35mm pro cameras ever had image stabilisation in the body. Anyhow, you can use either A or M mode with the manual lenses (this or M42 or whatever). The only difference between the regular A and M modes is that you set the aperture by turning a ring on the lens instead of a dial on the camera. The lens stops down immediately once you turn the ring, so generally you will first wish to focus wide open (manually, of course) and only then turn the ring to stop down, but this is only a problem for moving targets (which are ill-suited for manual focus anyhow). As for the infinity focus, my guide to the modification has instructions on how to adjust the infinity focus to match. Actually it's easy to get it going past infinity, the time-consuming part is trying to get it just right without limiting the maximum distance. So, non-perfectionists can just crank it a bit past infinity and sacrifice a bit of macro range. you can focus stopped down too, especially when there is enough light. the reason I say you'd need a tripod, is because if you are doing hand-held at close distances, the movement after the focus while you stop-down will throw you focus off (did that make any sense?). you could focus stopped down, but the extra depth of field would make accurate focus slightly more difficult for some of us. as the aperture decreases, required focusing acurracy also decreases.. for this reason i find myself using DOF preview when i'm at close distances, this way i don't have to go super-precise, i can see the actual DOF and act accordingly. overall, imho stop down focusing is good for close up photography, provided that there is enough light to focus.. you don't try to shoot macros at night anyway, do you?.. Well, I don't usually shoot very close distances with these lenses (everything focuses to infinity just fine), but with close-up and macro work I would use a tripod regardless of the lens (need to stop down for depth of field, increasing exposure time at my preferred ISO 100). For longer distances it's really not that sensitive with the focus, plus you don't need to move the camera away from your eye to stop down (count the clicks on the ring or just stop down until it the DoF looks about right). Also, like Turerkan said above, if there's enough light, one can focus stopped down. With the increased DoF it's seldom problematic, and in bright light it's quite easy to tell where the point of focus is by looking at the edges of details in the area. Here's one I did some time ago with my A100 and the 58mm f1.2. This was shot at wide open. Notice that the depth a field is so narrow the clapper is in focus but the flange on the bell is bit blurry, front and rear. BTW, it's news to me that one should turn off anti-shake with this lens. All the shooting I've done was with it turned on, inlcuding this one, and I haven't noticed any problems. Matter of fact, I thought I'd still get a degree of anti-shake, though not as much. Seemed to work for me. I've never embarrassed my A100 by hanging a tripod from its underments. 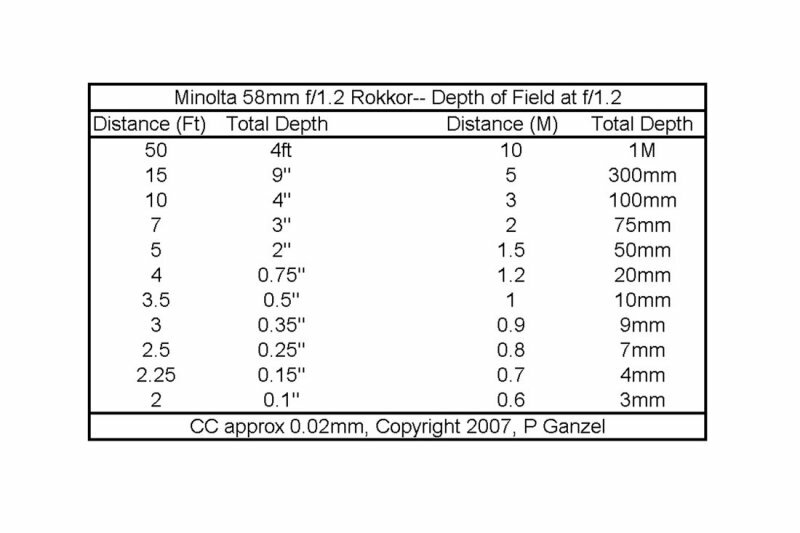 AS (or SS) seems to work to some extent without lens information, at least in this mid focal length range. I never shut it off. My entire 58mm Rokkor gallery was shot with AS on,hand held and wide open at f/1.2. The only images showing unsharpness are because of my careless focus. Beline: There are lenses in AF mount which are four stops slower than the f/1.2 wide open and folks have no problem focusing with them. BTW, why would you use this lens stopped down more than a stop or so? There are automatic iris, meter coupled, AF lenses that are probably better for that use. As Ed mentioned, the area in focus is very thin wide open at f/1.2. Here's a little chart done with calculations and testing showing what you are working with, but as you say, that's part of the charm of these lenses. Just want to tell you all I’ve done the same conversion for my 58/1.2. Tribute goes to Pete and Arkku for their inspiration. Pete in his homage said the thickness of the mount should be 7.75-8mm thick, and that gives me the idea of making the spacer myself, and plastic would be the most readily available and easiest material to handle. So what I did is instead of filing the mount spacer, I took the whole part out and use a piece of plastic that I use for model making (about 1mm thick) and trim it to the size of the mount spacer. I then use that piece of plastic to act as the spacer and mount the M42 adapter to the lens, and that’s it, and I don’t even have to adjust infinity. In fact, infinity focus at the 30 ft mark but that’s good enough for me. One more thing, the M42 adapter has to be filed a little bit, cos the lens aperture linkage will be jammed when you adjust the aperture. Here’s a picture I took wide open, hope you guys will like it. Would there be anything to stop someone *cough*me one day, maybe* successfully attempting to do a complete rokkor line up into a AF conversion? All done by fiddling with the mount and adding a m42~af adapter? Or would it not work for all lenses...? ?